New Feature - Calculation – How can we help you? We've been hard at work to bring you our newest great feature-- Calculation! This is a big one, and we're happy to be able to unveil it for you now! To be honest, it's impossible to give you a complete list of all the things that you can do with Calculation, because it's one of the biggest features that we've released so far. It goes hand-in-hand with App Rules (and the upcoming Autoscore) to allow you to create a new, improved application that's nothing like you've seen before. Calculation is available at the Enhance level and above, so if you're still at the Create level, contact our support team and get a demonstration of this great new feature! Previously, when you needed some math done in an application, you had limited options. You could ask the applicant to do it (and hope that they don't make any mistakes in the process), put the task on the evaluators, or you could run a report and ultimately have a spreadsheet program calculate things for you. But, now we're giving you new ways to tackle old problems quickly and easily. You can use Calculation to set up formulas throughout your application. These can be viewable to the applicant, evaluators, or even to just the administrators for your program, depending on your needs. Some items, like adding up income or weighing evaluation scores by multiplying them by different "weights", are perfect for applicants and/or evaluators, while others may simply be saving you some time on the administrator end (calculating financial need or a travel budget, for instance). Calculations are essentially Number questions with a whole lot of special functionality built in. Calculation questions automatically generate an answer based on data that has been entered into the application. Users who have permission to see Calculation questions will be unable to edit these calculated fields. Math functions include add, subtract, multiply, divide, and parentheses. Neat, huh? Let's take a closer look at how we go about setting up a calculation. 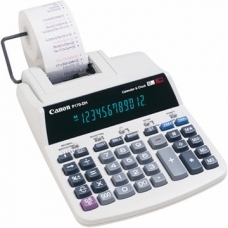 Calculations Have Never Been Easier! For our example, we'll show you how to set up a pretty simple (but pretty common) formula -- one designed to calculate financial status. First, create a new question to hold the calculation. We'll call it "Total Available Funds, 2014-2015," because that's what we ultimately want this calculation to tell us. 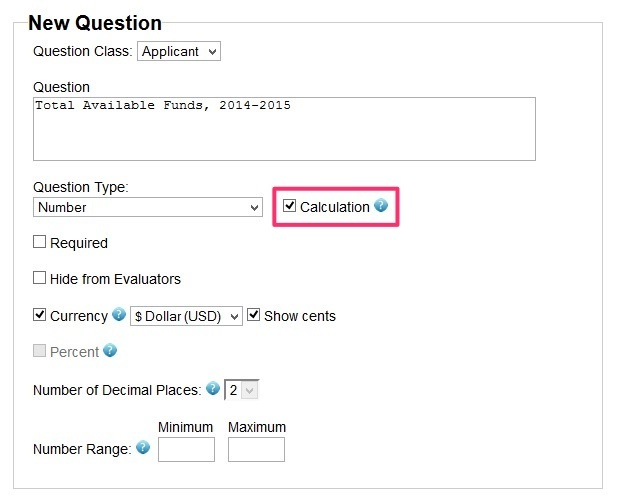 On the new Calculation page, the Total Available Funds question has automatically been added. Next, let's create the calculation by adding the income variables to our calculation. In this case, we're adding income from work, family contributions, and grants received. We'll also throw in an item to be subtracted-- interest paid. Income from work (A) + family contributions (B) + grants received (C) - interest paid (D) is equal to "Total Available Funds, 2014-2015." Hit "Test and confirm," and voila! The test result that we get here is exactly what we would have gotten if we'd done all that work manually! No more time sinks or messy Excel spreadsheets! Ready to dive into Calculation? Our incredibly skilled support team would be more than happy to help you with any questions that you have about Calculation, whether you want to know more about setting them up or just whether they're a good fit for your organization. We're available to answer your questions, demonstrate this great new feature, and help you set up your programs so that you can get the most out of them! If you have questions about getting started with Calculation, shoot our support team an email, request a demo, or attend one of our Q&A sessions-- there's no better way to find new and innovative ways to use our new features to revolutionize your application process! SmarterSelect is here to help you! SmarterSelect now offers a Weekly Webinar. This roundtable discussion with SmarterSelect staff and clients will give you tip & tricks and offers information about strategies and features that you may not be aware of yet. To sign up, simply email us, and we'll send you the information that you will need in order to attend. We look forward to enhancing your SmarterSelect experience! Do you have a question that isn't answered here? Check out our online support site for answers to the most frequently asked questions or create a support ticket of your own. In addition to our official support site, many of the users in the SmarterSelect community have offered helpful hints that can make your experience easier. If you have tips of your own to share or want to peruse what others have to offer, check out our forums for help from the community. If there's a feature that you would like to see on SmarterSelect, please let us know by submitting a feature request. We value your input and are constantly trying to improve our program to best suit your needs! Can I attach my own file to an application form?